The welcome arrival of the summer rains marks the start of the green season months in Thailand. The rains usually arrive in earnest in May, but it is in June when the Thai countryside starts to transform and takes on a noticeably greener hue. June is an ideal month for nature lovers to explore the rural areas of north and north-east Thailand. It’s also a wonderful time to sample an array of fresh tropical fruits with a number of varieties at their best in June as fruit lovers dive into durian, lunch on longans and go mad for mangosteen. Visiting Thailand in June during the tourist low season also brings advantages with many popular attractions less crowded and hotels offering discounts to fill their rooms. It’s also worth checking domestic airlines for green season deals with big savings often available on selected routes. If you spend a week or more in Thailand during June you can expect to see some rain, but in most areas you should also experience extended periods of sunshine and high temperatures during your stay. Although May signals the start of the rainy season in Thailand, June is statistically a drier month and can be an excellent time to visit. The weather is variable, but the heavier and more persistent rain tends to arrive later in the rainy season. Always be prepared for a change in the weather during June and even on cloudy days never underestimate the power of the sun’s UV rays. Blue skies and bright sunshine in the morning can be followed by afternoon thunder storms (and vice versa) so take that into consideration when deciding what to wear or making travel plans. Localised flash flooding can take place just about anywhere during a downpour in the rainy season. With storm drains struggling to cope with the tropical deluge, some streets temporarily turn into streams. Traffic in Bangkok can get even worse than usual during a downpour so add extra time if you are travelling to the airport or making transport connections. The flash flooding and downpours are all part of the Thailand experience and out of your control. Try to do what most of the locals do when the heavens open; take it in your stride, stay ‘jai yen‘ and patiently wait it out under shelter. Which is the best Thai island or beach resort to visit in June? There are distinct regional variations to the weather in Thailand in June. For the best prospects for a beach break with extended sunshine and a lower chance of rain, head to the Gulf of Thailand. That doesn’t mean you should totally dismiss the Andaman Coast although this side of Thailand does see higher average rainfall levels in June. Wherever you choose to stay, there are no guarantees with the weather so be prepared for variable conditions. The Gulf Coast of Thailand sees less rain in June compared to the Andaman Coast. If you’re looking for the best island to stay, the trio of Gulf islands; Ko Samui, Ko Pha Ngan and Ko Tao are good choices for a June beach break. If you prefer to stay on the mainland, the beaches of Hua Hin, Cha Am, Prachuap Khiri Khan, Pranburi, Chumphon and Khanom provide inviting options. The effects of the south-west monsoon mean that the Andaman Coast of Thailand sees higher levels of rainfall during June compared to the Gulf of Thailand. That doesn’t necessarily mean you are going to see rain every day. In fact, the heaviest and more persistent rains on the Andaman Coast tend to arrive at the very start of the rainy season (in May) and towards the end (September/October). You can still expect to see plenty of sunshine and warm temperatures in June, but if you want a two-week break where you do nothing more than sit on the beach all day you will need to lower your expectations. Staying on Phuket or in Krabi does you give you more options for things to do away from the beach on rainy mornings or afternoons. The smaller Thai islands in the Andaman, such as the Trang islands, can still be beautiful in June, but they are more exposed and there is less to do away from the beach and pool areas when it rains. Storms and big waves in the Andaman Sea can also see the suspension of boat services to smaller islands and some bungalow operations choose to close down from May to October or operate with reduced staffing. As a rough rule of thumb, the further east you go along Thailand’s eastern seaboard, then the more rain you are likely to see. Trat province, which includes the islands of the Ko Chang archipelago, sees particularly high levels of rainfall during June. However, at the opposite end of the eastern seaboard, Pattaya and Ko Samet experience more favourable conditions and are certainly worth considering if you’re looking for a beach break close to Bangkok. The important Buddhist holiday of Visakha Bucha usually falls in May, but does occasionally take place in June. The exact date varies from year to year because it is determined by the lunar calendar. The annual Phi Ta Khon Ghost Festival in Loei, north-east Thailand often takes place around June time although the exact date varies from year to year. By way of complete contrast, head south to the resort city of Hua Hin and enjoy smooth sounds by the beach at the Hua Hin Jazz Festival. 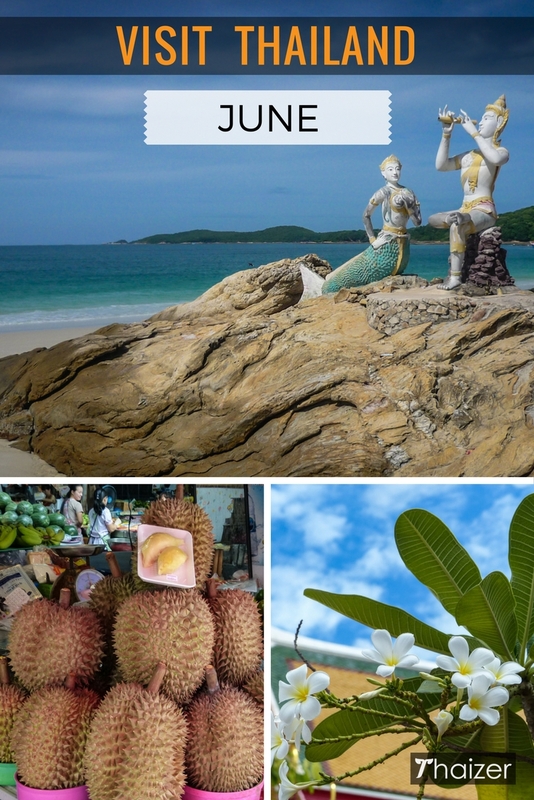 The eastern provinces of Thailand, including Rayong, Chanthaburi and Trat, are sometimes referred to as the ‘orchard of Thailand’. The agricultural heritage of the region is celebrated with a number of local fruit festivals in May and June. And staying with Rayong, the life and work of Thailand’s most famous poet is celebrated with Sunthorn Phu Day on June 26.